Fall is here. As the leaves begin making their final descent to the ground, I begin thinking of things that get me through our winter here in the Midwest and in CLE. One beacon of light that pulls me through Midwestern winters? The Cleveland International Film Festival! Each year, the Cleveland International Film Festival - aka CIFF - brings hundreds of films and thousands of people Downtown. The rate at which the CIFF is growing is mind-blowing! They break their own attendance numbers each year! More importantly, the caliber of films is undisputedly incredible. I watch films on IFC and Sundance Channel at home and regularly see films that I've already seen at the CIFF the year before. So. Cool. As a prelude to the Festival, they've begun Film Feasts, monthly events pairings of films, food and fun CLE spaces. Film Feasts is a series of events with a food theme that occur in the months leading up to CIFF. It's meant to wet your appetite (hey-o!) Proceeds benefit CIFF. Kitchen Stories is one of the first Film Feasts and, quite fitting, it occurs at one of my favorite new restaurants in the CLE, Noodlecat! The awesome-ness of Jon and Amelia Sawyer, owners and Cleveland champions, host this Film Feast at their newest restaurant, Noodlecat, a "slurpalious" Japanese noodle house on Euclid Avenue, steps from Public Square. They'll discuss their latest venture, along with the national success of Greenhouse Tavern, their award-winning restaurant around the corner on E.4th Street. I'm proud to say both restaurants are in DOWNTOWN CLEVELAND! If you've been meaning to try Noodlecat, this is your chance. Its seriously one of the best new resties in the CLE. Below is a description of the Film Feast. If you'd like to attend, visit this link here. There's only a few seats left. CIFF has generously provided me two tickets to Kitchen Stories @ Noodlecat. See you slurpers there. 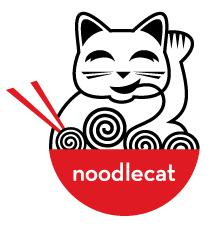 Wednesday, November, 9, 2011 / 7:00 p.m.
Come slurp the night away with us at one of Cleveland’s newest and most popular restaurants – Noodlecat. Join us as Jonathan Sawyer and Amelia Zatik-Sawyer share their inspiration behind their latest restaurant venture, and discuss what it took to open a new restaurant while balancing their time with their wildly successful other restaurant, The Greenhouse Tavern. You don’t want to miss this night of culinary delights, so make your reservations today before this cat is out of the bag. Film (and other ARTS) Feasts is a series of events to support the Cleveland International Film Festival. Our generous hosts underwrite the costs of their events and all proceeds directly benefit the organization. Learn about all of the Film Feasts on CIFF website.